© Hansra et al. ; Licensee Bentham Open. Adenoviral vectors are now being explored as vaccine carriers to prevent infectious diseases in humans and animals. There are two strategies aimed at the expression of a vaccine antigen by adenoviral vectors. The first includes an insertion of the foreign gene expression cassette into the E1 region. The second strategy is antigen incorporation into the viral capsid proteins. To extend this methodology, we have searched for new sites at the human adenovirus serotype 5 major capsid protein hexon for a vaccine antigen insertion. To this end, we utilized sites in the hexon hypervariable region (HVR) 7, 8 and 9 to display a 15-mer peptide containing the main neutralizing epitope of porcine reproductive and respiratory syndrome virus. However, we could not rescue the viruses with the insertions of the peptide into HVR 8 and 9, consistent with the viruses being unable to tolerate insertions at these sites. In contrast, the virus with the insertion of the peptide in HVR 7 was viable - growing well in cell culture and the inserted peptide was exposed on the virion surface. Keywords: Adenovirus, capsid-modification, hexon, vaccine. Human adenovirus type 5 (hAd5) vector has been shown to be an excellent vaccine delivery system in humans and animals [1, 2]. The replication-defective (E1-deleted) and replication-competent (E3-deleted) hAd5 have both been used as vaccine delivery vectors. For biosafety concerns, a replication-defective hAd5 is considered to be more suitable for vaccination. Replication-defective vectors may also have deletion in the E3 region to increase the amount of foreign DNA that can be inserted. Conventional strategy for the expression of a vaccine antigen by adenoviral vector includes insertion of the foreign gene expression cassette into the E1 region. This antigen is expressed as transgene after the infection of permissive cells with recombinant adenovirus. Apparent drawbacks of the conventional transgene expression of antigen include an inability of the hAd5-based vectors to produce a potent humoral response against certain antigens and, in some cases, the inability of the vector to express a foreign gene . To overcome such hurdles, the “antigen capsid-incorporation” strategy was developed . Incorporating an immunogenic peptide into the hAd5 capsid offers several potential advantages. Importantly, the processing of capsid-incorporated antigen via the exogenous pathway could result in a strong humoral response, similar to that generated by native hAd5 capsid proteins, and this strategy may also be useful in boosting antigen-specific antibody immune responses. Adenoviral capsid consists of the hexon, penton base and fiber . Antigenic epitopes could be incorporated into these proteins as well as into the minor capsid protein IX . Importantly, hexon is the most abundant of the capsid proteins, accounting for more than 83% of the capsid protein . Furthermore, hexon is shown to be a vaccine adjuvant . Early analysis of the hexon protein sequences revealed that, in addition to the conserved regions, there were 7 discrete hypervariable regions (HVRs) . In a subsequent study, they are reclassified as regions 1 to 9 . These HVRs do not appear to be involved in the binding of any other viral proteins, and the loops at the top of the HVRs are the most amenable to modifications. It was also shown that short heterologous peptides can be incorporated within the HVRs of hexon without affecting the viability of the virus [10, 11]. Incorporating antigens into hexon is applicable towards vaccination for several pathogens including the poliovirus, pseudomonas, B. anthracis, influenza, malaria and HIV [12-17]. In selected studies, protective immune responses in a mouse model are documented [12, 16]. In hAd5, HVR 1 through 6, and 8 have been used for the incorporation of foreign peptides [10, 18]. In this study, we explored different sites in HVRs 7, 8 and 9 of hAd5 hexon for the insertion of a peptide corresponding to the porcine reproductive and respiratory syndrome virus (PRRSV) main neutralizing epitope B  of the GP5 protein. Our results provide potentially applicable information for adenovirus-vectored vaccine development involving such hexon modifications, particularly in HVR 7. In order to access new sites in hAd5 hexon, tailored for the incorporation of foreign peptide sequences, we genetically inserted a 15 amino acid (aa) residue peptide into HVR7, HVR8 or HVR9 region of the hAd5 hexon. The peptide consisted of embedding a 9 aa residue sequence containing the PRRSV major neutralizing epitope flanked by the LGS spacer sequences (Fig. 1). 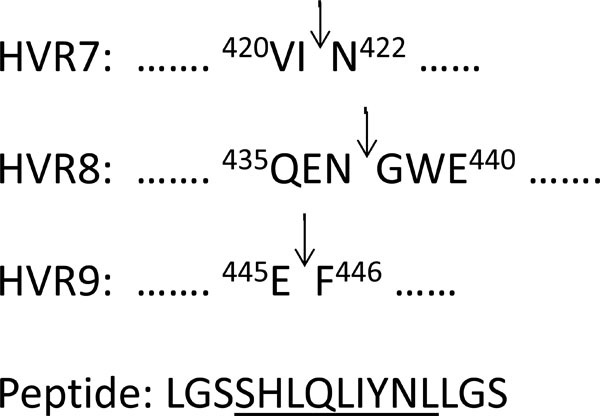 Sites in the HVRs that were modified with a peptide containing the PRRSV major neutralizing epitope B. The arrows mark the position where the peptide was inserted. The numbers show the positions of the amino acid residues in hAd5 hexon. Peptide sequence corresponding to the PRRSV epitope is underlined. PCR and restriction enzyme analysis of recombinant Ad5HVR7epB genome. Viral DNA extracted from Ad5HVR7epB infected HEK 293 cells was subjected to PCR (lane 1) and the PCR product was digested with AvrII (lane 2). The GeneRuler 1kb Plus DNA ladder (M) from Fermentas was used for sizing the DNA fragments. The sizes of some ladder bands are indicated. Titers of hexon-modified virus Ad5HVR7epB and non-modified virus Ad5-empty. Monolayers of HEK 293 cells cultured in 6-well plates were infected with the viruses. At different times post-infection, the cells and culture media were harvested, freeze-thawed and the viruses were titrated on HEK 293 cells. Values are expressed as the mean and standard deviation of two independent experiments. The PRRSV epitope incorporated in HVR7 of hexon is accessible in the context of an intact virion. In the assay, varying amounts of purified viruses were immobilized in the wells of ELISA plate and incubated with anti-peptide antibody. The binding was detected with an AP-conjugated secondary antibody. Values are expressed as the mean and standard deviation. * indicates a P value of < 0.05. Insertion of the DNA encoding peptide into the hAd5 hexon gene was achieved by PCR followed by bacterium-based homologous recombination. The linearized DNA of the plasmid containing the right portion of the hAd5 genome with modified hexon and the 1878 bp deletion in the E3 region was co-transfected into human embryo kidney (HEK) 293 cells together with a plasmid containing the left portion of the hAd5 genome with an E1-deletion. Homologous recombination in HEK 293 cells led to generation of the recombinant virus, termed Ad5HVR7epB. Multiple attempts to rescue the other two recombinant viruses (Ad5HVR8epB and Ad5HVR9epB) were not successful. This inability to rescue recombinant viruses with the foreign peptide insertion into HVR8 and HVR9 of hexon suggested that the insertion interferes with the formation of viral particles. Interestingly, in a previous study , hexon-modified virus with incorporation of the His6 peptide into HVR8 was reported to be viable. Our result with HVR8 is contradictory, evidently due to the differences in the peptides sequences and their lengths. Further, while the two studies are made with changes within HVR8, the specific locations of the incorporations differ as well. Notably our study uses a foreign sequence inserted between Asn437 and Gly438 (Fig. 1), while Wu et al. placed His6 between Pro431 and Trp439 substituting for 7 aa residues of hexon. To corroborate the insertion of the peptide encoding DNA into the hexon gene of hAd5, the viral genome fragment was amplified using PCR from the viral DNA extracted from Ad5HVR7epB-infected cells, and the PCR product was digested with AvrII since the peptide encoding DNA contained the single AvrII site. Predictably, a 1053 bp PCR fragment was amplified from Ad5HVR7epB DNA (Fig. 2, lane 1), and its site specific cleavage by AvrII provided two fragments: 650 bp and 403 bp (Fig. 2, lane 2). The results of this analysis suggested that recombinant Ad5HVR7epB contained the epitope B encoding sequence in the HVR7 of hexon. The growth kinetics of the recombinant virus Ad5HVR7epB was analyzed in HEK 293 cells. Cultures of the cells were infected with Ad5HVR7epB or Ad5-empty (E1-deleted and partially E3-deleted hAd5 with unmodified hexon), and the cells were harvested at 12, 24, 36, 48, 72 and 96 hr post infection intervals. Virus in each sample was released by freeze-thawing and titered on monolayers of HEK 293 cells. Fig. (3) shows the insertion of the peptide in HVR7, resulting in similar virus yields to unmodified virus with maximal titers ranging from 2 X 1011 to 1012 TCID50 per ml in a culture of 2 X 106 cells. We also determined the viral particle/infectious particle (VP/IP) ratio for CsCl gradient purified preparations of the control virus Ad5-empty, as well as the hexon-modified virus Ad5HVR7epB. A 2.7 fold increase was observed in the VP/IP ratio of Ad5HVR7epB preparations as compared to the unmodified control Ad5-empty (Table 2). A similar observation is reported for hexon-modified hAd5 with peptide incorporation into HVR2 or 5 . A typical VP/IP ratio of unmodified adenoviruses ranges from 10 to 44 . Synthetic oligonucleotides used for PCR to insert the sequence corresponding to the PRRSV epitope B into HVRs of Ad5 hexon. a Letters representing the sequences encoding the PRRSV epitope and flanking LGS amino acid residues are in bold. 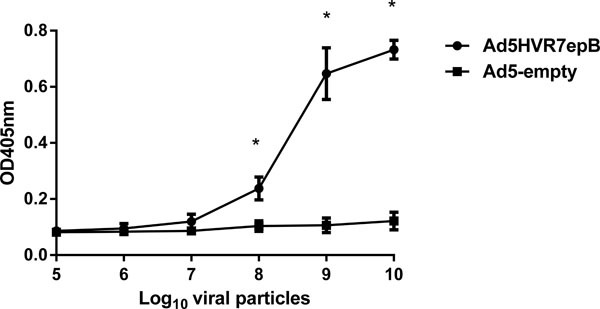 Numbers of viral and infectious particles in purified preparations of adenoviruses. We next examined whether PRRSV epitope was presented on the surface of the virion, using an ELISA binding assay. Different amounts of CsCl gradient purified viruses (Ad5HVR7epB and Ad5-empty) were immobilized on the wells of 96-well plates and incubated with peptide antisera. The binding of antibodies to the virions was detected with alkaline phosphatase (AP)-conjugated secondary antibody, followed by AP color reaction development. Evidently, the anti-peptide antibodies bind well to AdHVR7epB virions and not to Ad5-empty (Fig. 4). This suggests that the PRRSV epitope inserted into HVR7 of hexon is exposed on the virion surface. While a previous study showed that epitopes were exposed on the virion surface when incorporated in HVR1, HVR2 and HVR5, and not exposed in HVR3 and HVR6, as well as poorly exposed when a peptide was placed in HVR8 . In the current study, we find a new site in HVR7 for incorporation of foreign peptide into hAd5 hexon, and determine that the peptide was also exposed on the virion surface making it readily accessible for antibody binding and be potentially useful for vaccination. Herein, we report a novel adenovirus vector (Ad5HVR7epB) with the insertion of the PRRSV main neutralizing epitope B in 3 different HVR regions of the major capsid protein hexon. While the insertion of the peptide into HVRs 8 and 9 were not tolerated by the adenovirus, the 9-mer epitope placed within HVR7 is determined to be exposed on the virion surface. Plasmid pUC-Ad5-hex was used as a template for PCR and as a cloning vector. This plasmid contained a 5.2 kb DNA fragment of hAd5 genome encoding a portion of the hexon gene. To insert the DNA sequence encoding the main neutralizing epitope B of PRRSV in HVR7 and obtain the DNA fragment for cloning, four consequent PCRs were performed using Phusion high-fidelity DNA Polymerase (NEB). First, a 1 kb fragment was amplified using primers BL7F1 and Nhe-R, and pUC-Ad5-hex as a template. Second, a 1 kb fragment was amplified using primers BLF2 and Nhe-R, and the product of PCR 1 as a template. Third, a 690 bp fragment was amplified using primers BL7R and Nde-F, and pUC-Ad5-hex as a template. Fourth, a 1.7 kb fragment was amplified using primers Nde-F and Nhe-R, and the mixture of the products of PCR 2 and 3 from above as a template. The final 1.7 kb PCR product was digested with NdeI and NheI and cloned into NdeI and NheI sites of pUC-Ad5-hex, creating pUC-Ad5hex-HVR7epB. Similar strategy was used to construct pUC-Ad5hex-HVR8epB and pUC-Ad5hex-HVR9epB. Specific sequences of the primers are presented in Table 1. The plasmid pH5R-hexHVR7epB was generated by homologous DNA recombination in E. coli BJ5183  between a 2.6 kb DNA fragment excised by KpnI and NdeI from pUC-Ad5hex-HVR7epB and BamHI-linearized pH5R . Similar strategy was used to construct pH5R-hexHVR8epB and pH5R-hexHVR9epB. Fig. (1) shows the sites of the insertion of the peptide in the hAd5 hexon protein sequence. Human embryonic kidney (HEK) 293 cells were transfected with PacI-digested DNAs of the plasmids pH5R-hexHVR7epB, pH5R-hexHVR8epB or pH5R-hexHVR9epB and PacI-digested pH5-L  using Lipofectamine-2000 (Invitrogen). Homologous recombination in the transfected cells led to generation of the recombinant adenovirus, and the virus was detected by developing cytopathic effect (CPE) in the cell monolayer. If CPE was not detected by the 14th day after transfection, the cells and the cell culture media were collected and freeze-thawed. This material was used to infect a fresh monolayer of HEK 293 cells. The virus was amplified by passaging in HEK 293 cells and purified by CsCl gradient centrifugation . The concentration of virus particles (VP) in purified virus preparations was determined by measuring the optical density at 260 nm as previously described , whereas numbers of infectious particles (IP) were determined by the tissue culture infective dose 50 (TCID50) method . HEK 293 cells grown in wells of 6-well plates were infected with Ad5-empty or Ad5HVR7epB viruses at a multiplicity of infection (m.o.i.) of 5. Infected cells were harvested at the indicated time intervals post-infection. Cells were lysed in the growth medium by freezing-thawing three times. The titres of infectious viral progeny were determined by TCID50 method in monolayers of HEK 293 cells. HEK 293 cells grown in T75 flasks were infected with the virus Ad5HVR7epB. After 48 hours post infection, when full CPE was observed, the cells and cell culture media were harvested followed by 3 cycles of freezing and thawing. Cell debris was removed by centrifugation at 1,500 rpm for 5 min, and the supernatant (275 μl) was used for viral DNA isolation. Briefly, the supernatant was incubated with 10 μl of DNase I (10 mg/ml) at 370C for 30 min, followed by addition of 6 μl of 0.5 M ethylenediaminetetraacetic acid (EDTA) (pH 8.0), 7.5 μl of 20 % sodium dodecyl sulfate (SDS), 1.5 μl of Proteinase K (20 mg/ml) and incubation at 500C for 1 h. Total DNA was further extracted using a GeneClean Spin Kit (MP Biomedicals) according to the manufacturer’s instructions. The isolated DNA was subjected to PCR using Fermentas (2X) PCR Master Mix and primers (5’-ATCATGCAGCTGGGAGAGTC-3’ and 5’-CATTGCCCAGCAACATTGAG-3’) that were designed to anneal in the sites flanking the hexon HVRs. 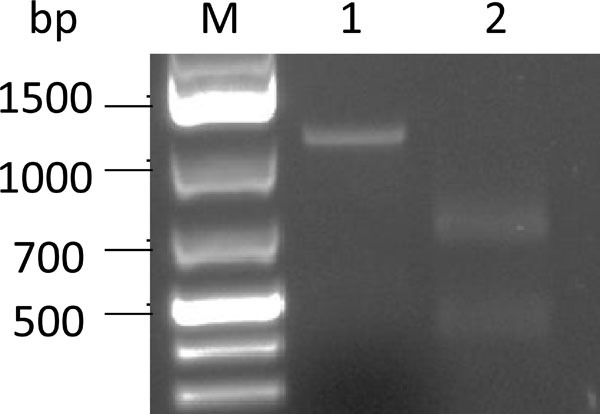 Amplification product was digested by AvrII and size-separated by electrophoresis in 1 % agarose gel. The peptide, containing amino acid residues of the PRRSV neutralizing epitope B (SHLQLIYNL), was synthesized by GenScript Inc. The peptide was conjugated to keyhole limpet hemocyanin (KLH) or bovine serum albumin (BSA) as carrier molecules. Two New Zealand White rabbits were immunized with the conjugated peptide (500 μg/rabbit) emulsified with Freund’s Complete Adjuvant (FCA) followed by two injections of conjugated peptide (300 μg/rabbit) in Freund’s incomplete adjuvant (FIA) at four weeks apart. Serum was collected ten days after the third injection and tested for ability to bind to the peptide by ELISA. The enzyme-linked immunosorbent assay (ELISA) binding assay was used to test if the peptide incorporated into the hexon protein is accessible to anti-peptide antibody at the virion level. Different amounts of purified virions ranging from 105 to 1010 viral particles were immobilized on the wells of a 96-well plate (IMMULON, Thermo Scientific) by overnight incubation in 100 ul/well of 100 mM carbonate buffer (pH 9.5) at 4 0C. After washing with PBS, containing 0.05% Tween 20, the immobilized virus was incubated with 1:500 diluted anti-peptide rabbit serum for 4 h at 25 0C, followed by AP-conjugated goat anti-rabbit antibody (Cedarlane) incubation. Color reaction was performed with p-nitrophenyl phosphate (Sigma-Aldrich), and optical density at 405 nm was measured with a microplate reader. This work was supported by grants from the Canadian Swine Health Board and the Saskatchewan Ministry of Agriculture. We thank the staff of the VIDO-InterVac Animal Care Unit for immunizations of rabbits. This paper was published with the permission of the Director of VIDO-InterVac, journal series no. 719. Lasaro MO, Ertl HC. New insights on adenovirus as vaccine vectors Mol Ther 2009; 17: 1333-9. Ferreira TB, Alves PM, Aunins JG, Carrondo MJ. Use of adenoviral vectors as veterinary vaccines Gene Ther 2005; 12: S73-83. Kheyar A, Jabrane A, Zhu C , et al. Alternative codon usage of PRRS virus ORF5 gene increases eucaryotic expression of GP(5):glycoprotein and improves immune response in challenged pigs Vaccine 2005; 23: 4016-22. Matthews QL. Capsid-incorporation of antigens into adenovirus capsid proteins for a vaccine approach Mol Pharm 2011; 8: 3-11. Rux JJ, Burnett RM. Adenovirus structure Hum Gene Ther 2004; 15: 1167-76. Coughlan L, Alba R, Parker AL , et al. Tropism-modification strategies for targeted gene delivery using adenoviral vectors Viruses 2010; 2: 2290-355. Rux JJ, Kuser PR, Burnett RM. Structural and phylogenetic analysis of adenovirus hexons by use of high-resolution x-ray crystallographic, molecular modeling, and sequence-based methods J Virol 2003; 77: 9553-66. Molinier-Frenkel V, Lengagne R, Gaden F , et al. Adenovirus hexon protein is a potent adjuvant for activation of a cellular immune response J Virol 2002; 76: 127-35. Crawford-Miksza L, Schnurr DP. Analysis of 15 adenovirus hexon proteins reveals the location and structure of seven hypervariable regions containing serotype-specific residues J Virol 1996; 70: 1836-44. Wu H, Han T, Belousova N , et al. Identification of sites in adenovirus hexon for foreign peptide incorporation J Virol 2005; 79: 3382-90. Matthews QL, Yang P, Wu Q , et al. Optimization of capsid-incorporated antigens for a novel adenovirus vaccine approach Virol J 2008; 5: 98. Worgall S, Krause A, Qiu J, Joh J, Hackett NR, Crystal RG. Protective immunity to pseudomonas aeruginosa induced with a capsid-modified adenovirus expressing, P aeruginosa OprF J Virol 2007; 81: 13801-8. Crompton J, Toogood CI, Wallis N, Hay RT. Expression of a foreign epitope on the surface of the adenovirus hexon J Gen Virol 1994; 75: 133-9. Matthews QL, Fatima A, Tang Y , et al. HIV antigen incorporation within adenovirus hexon hypervariable 2 for a novel HIV vaccine approach PLoS One 2010; 5: e11815. Krause A, Joh JH, Hackett NR , et al. Epitopes expressed in different adenovirus capsid proteins induce different levels of epitope-specific immunity J Virol 2006; 80: 5523-30. Shiratsuchi T, Rai U, Krause A, Worgall S, Tsuji M. Replacing adenoviral vector HVR1 with a malaria B cell epitope improves immunogenicity and circumvents preexisting immunity to adenovirus in mice J Clin Invest 2010; 120: 3688-701. McConnell MJ, Danthinne X, Imperiale MJ. Characterization of a permissive epitope insertion site in adenovirus hexon J Virol 2006; 80: 5361-70. Gu L, Li ZC, Krendelchtchikov A, Krendelchtchikova V, Wu H, Matthews QL. Using multivalent adenoviral vectors for HIV vaccination PLoS One 2013; 8: e60347. Ostrowski M, Galeota JA, Jar AM, Platt KB, Osorio FA, Lopez OJ. Identification of neutralizing and nonneutralizing epitopes in the porcine reproductive and respiratory syndrome virus GP5 ectodomain J Virol 2002; 76: 4241-50. Both GW, Cameron F, Collins A, Lockett LJ, Shaw J. Production and release testing of ovine atadenovirus vectors Methods Mol Med 2007; 130: 69-90. Reddy PS, Ganesh S, Hawkins L, Idamakanti N. Generation of recombinant adenovirus using the Escherichia coli BJ5183 recombination system Methods Mol Med 2007; 130: 61-8. Zakhartchouk AN, Viswanathan S, Mahony JB, Gauldie J, Babiuk LA. Severe acute respiratory syndrome coronavirus nucleocapsid protein expressed by an adenovirus vector is phosphorylated and immunogenic in mice J Gen Virol 2005; 86: 211-5. Tollefson AE, Kuppuswamy M, Shashkova EV, Doronin K, Wold WS. Preparation and titration of CsCl-banded adenovirus stocks Methods Mol Med 2007; 130: 223-35. Mittereder N, March KL, Trapnell BC. Evaluation of the concentration and bioactivity of adenovirus vectors for gene therapy J Virol 1996; 70: 7498-509. Zakhartchouk AN, Wu Q, Tikoo SK. Construction of capsid-modified recombinant bovine adenovirus type 3 Methods Mol Med 2007; 130: 91-106.